A group of six Chagossians based in the Seychelles when visiting the archipelago after the British government allowed them to visit the islands for a week in May 2015. The future of an Indian Ocean archipelago which is the last remaining African colony of the old British Empire came into sharp focus at the International Court of Justice (ICJ) last week. 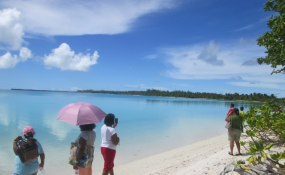 Legalbrief reports that the Chagos Islands were home to a Bourbonnais Creole-speaking people for more than 150 years until the UK evicted them between 1967 and 1973 to allow the US to build a military base on Diego Garcia. As a result, the 2 000 residents were sent to Mauritius and the Seychelles. A report on the Quartz Africa site notes that while Mauritius obtained its independence in 1968, the islands remained under British control and an immigration order preventing Chagossians from returning was issued in 1971. Australia, Israel and the US are backing the UK stance while Mauritius has the support of 17 countries (Argentina, Belize, Botswana, Brazil, Cyprus, Germany, Guatemala, India, Kenya, Marshall Islands, Nicaragua, Nigeria, Serbia, South Africa, Thailand, Vanuatu and Zambia). The UK used its platform at The Hague to apologise for the 'shameful way' residents of the disputed territory were evicted. However, it insisted that Mauritius was wrong to bring the dispute over ownership of the islands by saying the matter was 'purely a bilateral issue'.A report on the Al Jazeera site notes that UK Solicitor-General Robert Buckland asked the judges to 'decline the request for an advisory opinion'. Mauritius' lawyers said the Chagos Islands were 'integral' to its territory and it was handed to the UK 'under duress'. 'More than 50 years after independence... the process of decolonisation of Mauritius remains incomplete,' former Mauritian President Anerood Jugnauth told The Hague-based court. The Guardian reports that Mauritius' Defence Minister Sir Anerood Jugnauth told the court that his country was coerced into giving up a large swathe of its territory before independence. That separation was in breach of UN resolution 1514, passed in 1960, which specifically banned the break-up of colonies before independence, the Mauritian Government argued before the UN-backed court, which specialises in territorial and border disputes between states. 'I am the only one still alive among those who participated in the Mauritius constitutional conference at Lancaster House (in London) in 1965, where talks on the ultimate status of Mauritius were held. Those talks resulted in the unlawful detachment of an integral part of our territory on the eve of our independence,' he said. Jugnauth added that the 'secret meetings' were not made known to the other Mauritian representatives 'although we were later told of the immense pressure that was imposed on the small group'. The Telegraph reports that the hearing is seen as a critical test of Britain's diplomatic clout in the Brexit era, after it failed to rally enough to support to prevent the UN General Assembly adopting the resolution that led to this week's hearing. Legalbrief reports that Ndivhuwo Mabaya, spokesperson for South Africa's Department of International Cooperation said it is the duty of every member state of the UN to leave no stone unturned to assist the General Assembly 'to remove the last vestiges of colonialism and for all peoples to achieve self-determination and freedom'. In an interesting twist, the Chagos community in the Seychelles has expressed concerns over the Mauritian Government's demands. Pierre Prosper, chairperson of the Chagos Association in Seychelles, reportedly told the S eychelles News Agency that the government's interest is commercial and has nothing to do with the welfare of the Chagos community. 'This is clear today as we look at the conditions, especially the living conditions and welfare of the Chagossians living in Mauritius,' he said. Prosper said Mauritius is seeking rent from the US and new fishing grounds. 'My biggest fear is that if this happens the Chagossians will find themselves in a darker hole,' he added. Copyright © 2018 Legalbrief. All rights reserved. Distributed by AllAfrica Global Media (allAfrica.com). To contact the copyright holder directly for corrections — or for permission to republish or make other authorized use of this material, click here. South Africa: Is SA Facing a Watergate Moment? Africa: Will Saudi Journalist Khashoggi's Killing Sink African Projects? South Africa: Govt to Backtrack on Pulling Out of Hague Court? Southern Africa: Judges Crack Down on 'War on Women' - But Will It Help?